After watching ‘nothing’ again I realise what a genius the man is. A 50 minute act from Staples. Anyone interested in mind reading must watch this. 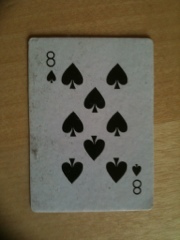 Recently purchased split spades marked deck by David Blaine. They are the easiest cards to read, even at 5-6 feet and are of excellent quality. Marking is well hidden so will not be seen by spectators. (and not too expensive either)!! Just bought Colin Mcleod dvd. Some fascinating thoughts on mentalism. Thoroughly recommended. Will post later when all watched.